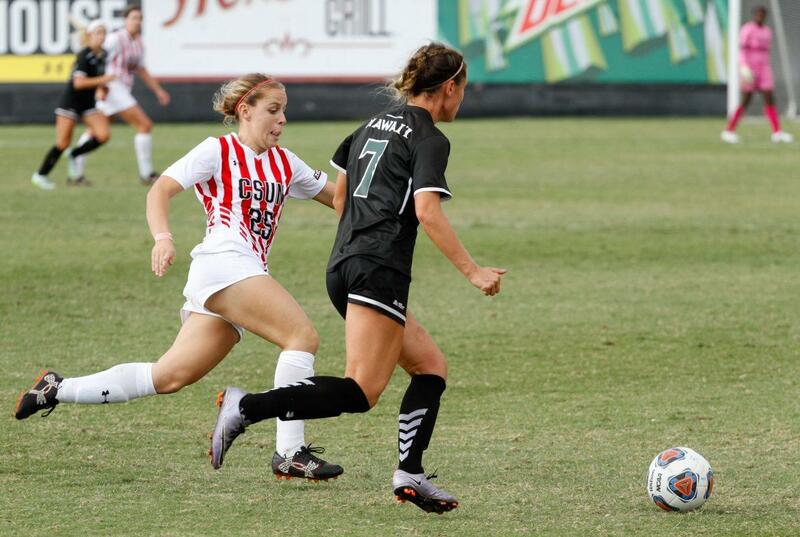 CSUN women’s soccer team (6-4-5) came up clutch on Thursday evening as Bret Guarino scored the game-winning goal in the 83rd minute to defeat UC Riverside (6-8-2) 1-0. Bret Guarino scored her first goal of the season off a scramble in the box after a corner kick. Riverside was unable to clear the ball, and Guarino was able to net it in past the goalie off a quick touch pass by Destinney Duron. The Matadors played an aggressive game taking 13 shots compared to the Highlanders six, with five of those being shots on goal. Riverside held the advantage in corner kicks 5-2 but that second corner for CSUN proved to be the difference maker in the game. In the 14th minute, Cynthia Sanchez looked to add another goal to her fantastic college career but had it blocked. Kirsten Von Meter pounced on the loose ball and had the opportunity to give the Matadors the lead, but her shot was just high. Sylvia Trinh added her name to the mix in the 18th minute as she took a shot, but was wide right. Riverside couldn’t do much in the first half as they barely held possession of the ball. CSUN was in full control as they took two more shots before the end of the first half, but fell short on both attempts. It was only a matter of time their aggressive play style would pay off. UC Riverside was aggressive to start the second half as they took two shots within a four-minute time span. UCR Ashley Webb had her shot hit the crossbar they couldn’t capitalize on the ricochet as CSUN was able to clear the ball. Both teams would go on to take multiple shots throughout the second half, but neither side capitalized on any openings. Riverside’s Nerisse Bugho came into the game in the 77th minute and within moments made her presence felt. She nearly gave the Highlanders a 1-0 lead in the 81st minute but had her shot blocked by CSUN senior Jovani McCaskill. CSUN’s aggressive attitude from the start of the match paid off as the spotlight shined on sophomore Bret Guarino and she delivered for her first goal of the season and a 1-0 lead. Riverside had an opportunity in the 85th minute to tie the game off a corner by Darielle O’Brien, but the Matadors did a good job clearing the ball, and that’s all she wrote. The Matadors look to add on to their two-game win streak against Hawai’i on October 15th.